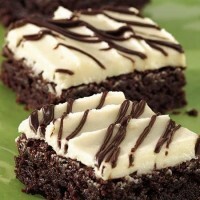 Let creamy liqueur turn packaged brownie mix into sophisticated treats with semisweet chocolate glaze. Bake at 350°F. for 25 to 30 minutes or until brownies are set and begin to pull away from sides of pan. DO NOT OVERBAKE. Cool 45 minutes or until completely cooled. Place glaze ingredients in small microwave-safe bowl. Microwave on HIGH for 30 seconds; stir until melted and smooth. Drizzle over frosted brownies. Refrigerate 30 minutes or until firm. Irish cream liqueur contains Irish whiskey, sugar and cream. Depending on the brand, the liqueur may have spicy toffee or honey chocolate flavors. Brownies are done when edges look dry and start to pull away from the sides of the pan. Bake the brownies for the minimum time recommended, and then check their edges. Remove the brownies from the oven as soon as the edges are done; overbaked brownies are dry and hard.